If you wish to do your Dentistry Elective in Ghana, you will have a choice of a large hospital in a city, or working in a more rural setting. You will shadow one of our supervisors who all speak English and are very experienced at working with western students. They will be keen to test out your dental knowledge, as well as giving you the benefit of their training and experience. The hospitals where we work are experienced in working with students on their Dentistry Electives. You will find yourself coming into contact with conditions that you wouldn't normally see in Europe and North America. You will find treatment will differ from what you are used to. This experience will be challenging, but will also provide you a wealth of experience and be hugely rewarding. An elective placement overseas is an excellent base for learning and improving your dentistry skills and will help towards furthering your career in Dentistry. You can volunteer in one of the large busy city hospitals. In Accra our dental volunteers work at the large Police hospital in the neighbourhood popularly known as Danquah Circle. 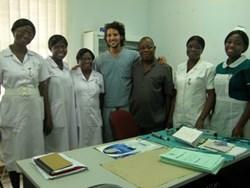 The Central Regional Hospital in Cape Coast is another option for dental volunteers. It is one of the most modern hospitals in Ghana. Dental volunteers can also be based in one of six busy city hospitals in Kumasi serving between them over 1.5 million people. If you prefer, you can volunteer in a smaller town hospital. In Koforidua, anyone with skills in Dentistry can be based in the town’s large state run regional hospital. In the semi-rural Akuapem Hills, the hospital is much smaller. Here patients from a huge catchment area have often travelled many miles to reach the hospital with the facilities they need. On your arrival at the hospital, your Projects Abroad coordinator, and the project supervisor, who will be a member of the hospital staff, will discuss your work schedule with you. When volunteering in Ghana, you will live with local host-families. There is plenty to do in whichever region of Ghana you are located and, as one of our most popular destinations; there will always be a large Projects Abroad volunteer community for you to get to get know and spend time with.